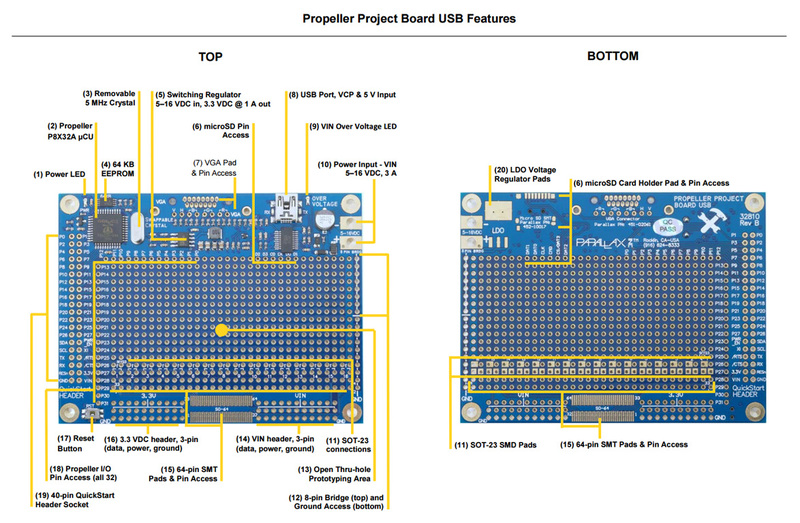 Propeller Project Board USB Schematics. 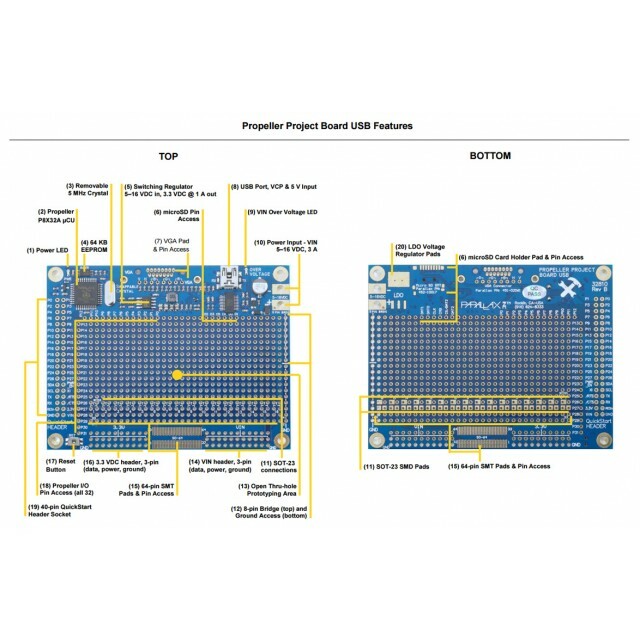 Propeller Project Board USB Product Guide. 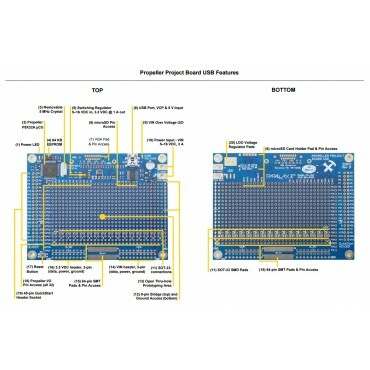 This board is for projects that need a permanent home. 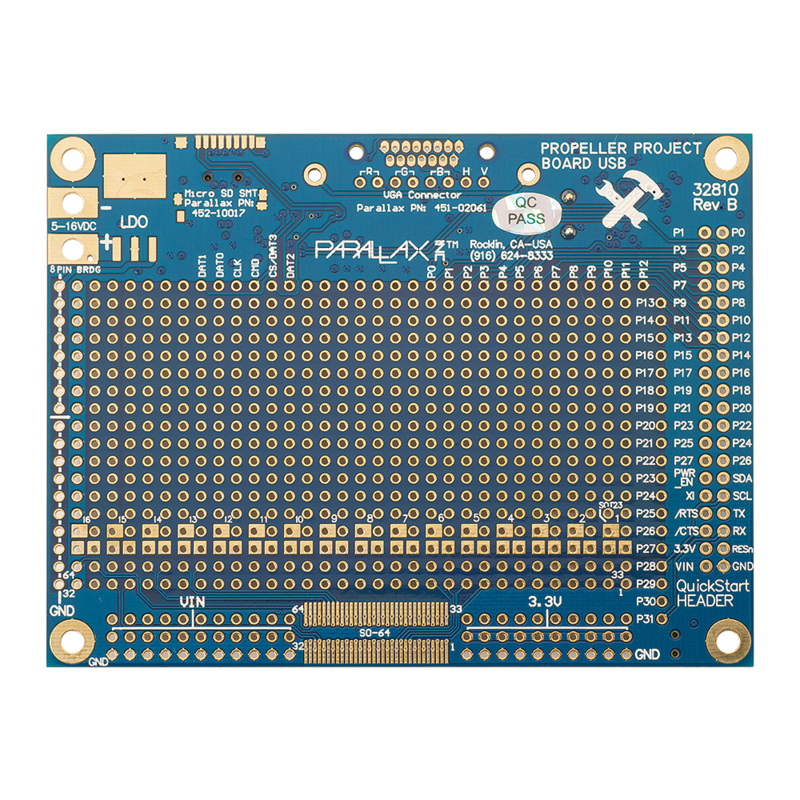 Its low cost, feature-rich, and simple design is ideal for most any project using the Propeller P8X32A multicore microcontroller. 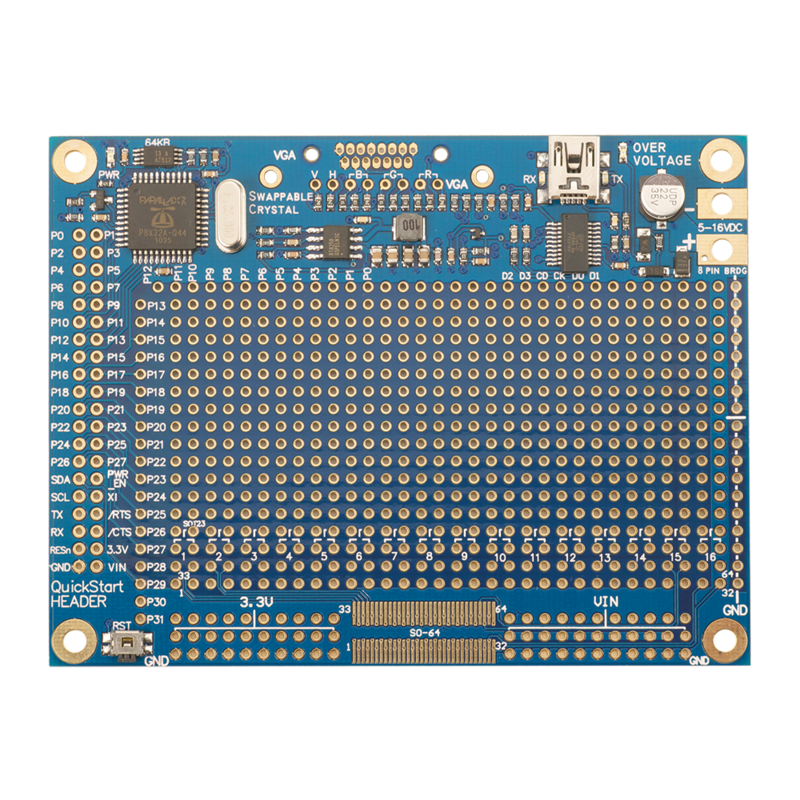 The core Propeller programming circuitry is built into the board, with access to all 32 I/O pins. 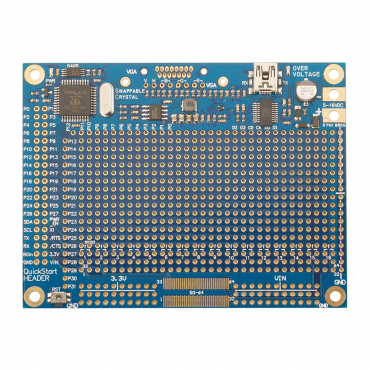 Thoughtful features such as power and over-voltage LEDs and well-placed labels on both sides of the board help make circuit-building fast and accurate. The reset button, USB, power, and optional connectors are all set at right angles for easy access when the finished project is mounted in an enclosure. 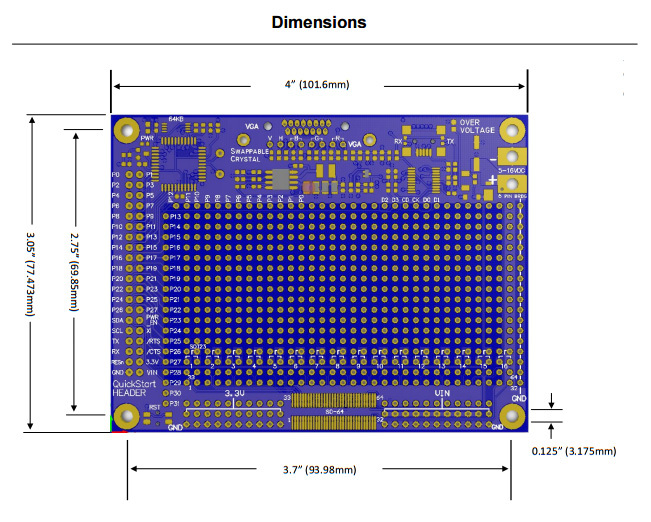 Programming-ready with surface-mount Propeller P8X32A, 64 KB EEPROM, and 5 MHz removable crystal. USB Mini-B connector for programming and power is compatible with USB charging devices. Large 5.75 square-inch prototyping area with 580 thru-hole connections provides plenty of room for your project's components. Built-in pads and circuitry make it easy to add a microSD card holder and VGA connector. 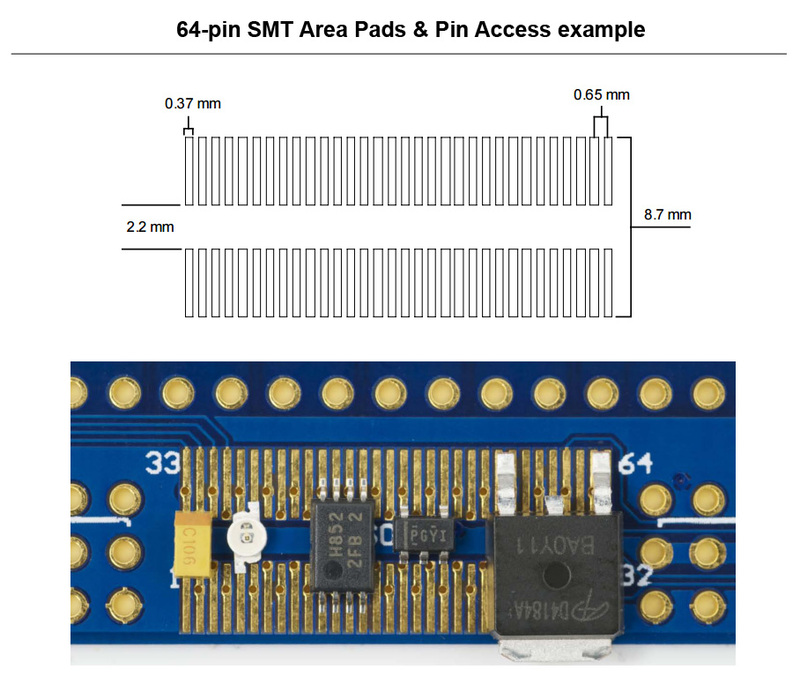 SOT-23 pads and custom-designed 64-pin SMT pads accommodate a wide variety of IC packages. 40-pin header accepts add-on boards made for the Propeller QuickStart. 64-pin SMT pads for SO type SMD, 0603, 0805, 1206, SOT-223, CDFP and SSOP. Power and Over Voltage LEDs. 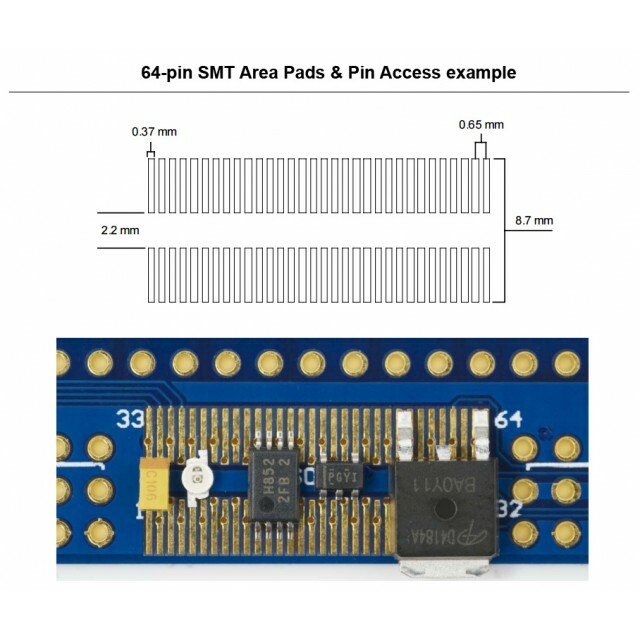 Pads and circuitry for optional VGA connector. Pads and circuitry for optional microSD card holder. External power pads accept 12 AWG wire, alligator clips, screw terminal (#452-00012), or center-positive barrel jack connector. VIN on board 16V @ 3Amax. VIN on board 16V @ 3 A max. Power Requirements: USB power or 5 to 16 VDC via external input. Communication: USB Mini-B for serial-over-USB. Dimensions: 3.05 X 4 in (7.7 X 10.2 cm).